Last year when I traveled the Oregon coast, I did my first ever drawings of the ocean. The more I watched the sea surging back and forth, splashing on the rocks and rolling onto the pebbly shore, I knew I had to try this type of scene. Yachats, Oregon is now my favorite place for rocks and waves. There’s are two wonderful parks with great access to incredible views. I can park so I can see my subjects from my van. Arriving early in the morning, I started with the usual walk along the beach. Strolling the strand to the south of town, the fabulous view was enhanced by clumps of sea thrift adding bold pink accents to the seascape. As I usually do, I made notes of possible drawing locations and took photos along the route. It was hard to choose where to start. I liked the shapes of these rocks and windswept trees and bushes. About three quarters of the way through the drawing it was apparent that I had over-inked it. I was careful not to make it too black and crossed my fingers that watercolor would redeem it. I think it did. Color adds the all important contrast and design elements. I continued adding values to define the rocks. Drawing intently on the largest mass of rock, I didn’t realize the tide was coming in. 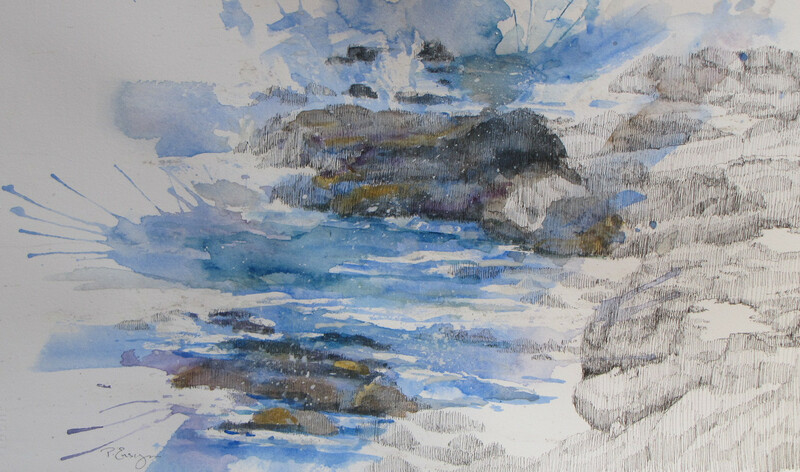 Three hours into the drawing I discovered the smaller rocks in the foreground were barely visible under the water. Note to self: check the tide chart and draw the lowest items first. I could sit and watch the waves crash over these rocks all day. But then of course, I wouldn’t get any drawing done.